Home Stock & Shares Investing In Scandinavia: The Nordics Regularly Top World Happiness Indices But What About Their Equities Indices? Investing In Scandinavia: The Nordics Regularly Top World Happiness Indices But What About Their Equities Indices? Every year a handful of ‘best countries’ indices are published. These are based on quality of life perceptions of citizens and how content they are with their lot as well as how others see the quality of life in countries around the world. They take into consideration factors such as affordability (based on the ratio between local salary levels and living expenses) the job market, economic and political stability, income equality, if the country is ‘family friendly’, safety and public education and health systems. The Nordic countries of Sweden, Denmark, Norway and Finland inevitably take up four of the top six spots with Canada and Switzerland the non-Scandinavian representatives. Regardless of how scientifically objective such ‘happiness’ and ‘quality of life’ indices can really be, on the whole, life appears to be good for the citizens of the Nordic states. Even if the prices there translated into other global currencies make tourists wince. The locals, on salaries denominated in local currencies, can generally afford a good standard even if they are not particularly well paid within the national context. And they can certainly enjoy themselves on holiday where almost anywhere seems cheap in comparison! But what about investing in the Scandinavian financial markets? Are the northern stock market indices as expensive as the beer or coffee shops? With sky high salaries and taxes, it will come as no surprise that the companies listed on the main stock exchanges of Oslo, Stockholm, Copenhagen and Helsinki are weighted towards high value, high margin sectors. Scandinavia certainly doesn’t compete with Asia as a cost-efficient manufacturing hub. There are notable exceptions such as H&M parent, Sweden’s Hennes & Mauritz AB. But of course, H&M doesn’t manufacture its fast fashion merchandise at home. Even Iceland’s Reykjavik has a small stock exchange comprised of 18 companies, mainly in the financial sector. Still, it is safe to say that the economic success of Nordic companies is based on high levels of innovation, both in technology and processes, high margin products and services and high levels of productivity. Source: Cornell University, INSEAD, and WIPO (2018): The Global Innovation Index 2018: Energizing the World with Innovation. Ithaca, Fontainebleau, and Geneva. Sweden comes in at third place on the 2018 list of countries based on their contemporary record of innovation. 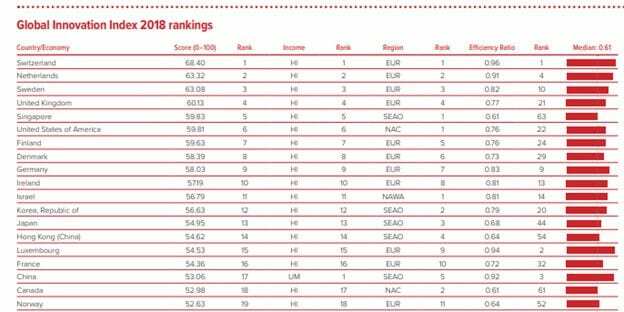 Finland Denmark are in 7th and 8th spots respectively and Norway a strong 19th from every recognised territory in the world. And they have lots of oil. While modern Norway undoubtedly has a lot going for it, it is hard to argue its economic success has not been founded on its oil and gas reserves – by far the largest in Western Europe. As recently as half a century ago, Norway was one of Europe’s poorest countries with up to 40% of a family’s income spent on feeding itself. However, it is also hard to argue that Norway hasn’t managed its oil wealth extremely well and with a long term horizon. It has funded very strong public health and education systems as well as a national infrastructure that means even more remote areas, particularly further north, are well connected. The country only spends a maximum of 4% of its oil income every year, investing the rest in the country’s future. Its national Sovereign Wealth Fund is considered a model in sustainability. 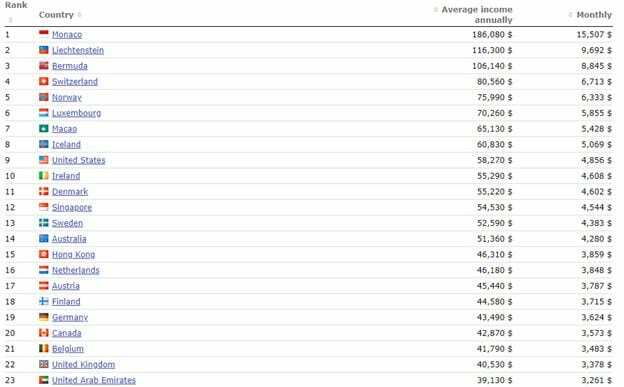 While Norway’s luck in possessing huge oil reserves means it is the richest of the Nordic nations, both as a state and based on average individual income levels, GDP per capita and wages are high across Scandinavia. 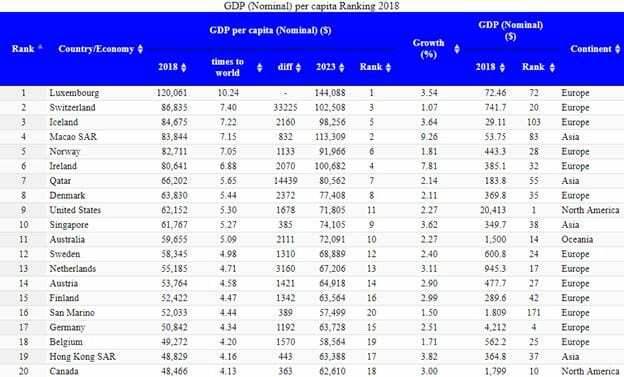 All 4 Nordic nations figure in the world’s top 15 countries in terms of GDP per capita. 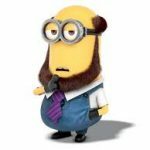 A common misconception around the Nordic corporate landscape is high taxation. In fact, corporate tax levels are below or around those in the USA. It’s true that personal income tax levels are high but they are also relatively flat, incentivising wealth creation. And while inequality is growing and the Nordics are not quite the financially egalitarian utopia of legend, salary levels are more or less high enough to support that. 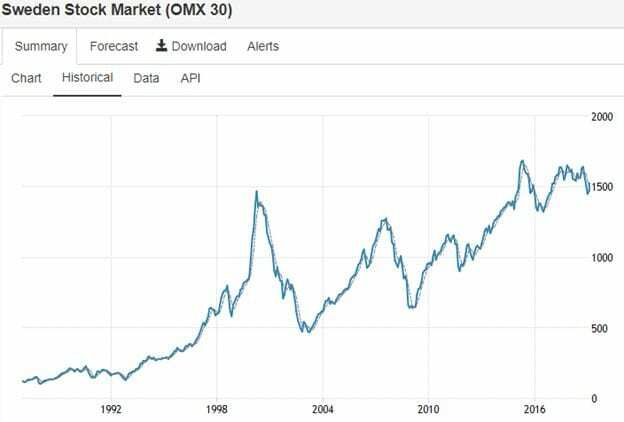 Over the 27 years since 1992, Sweden’s OMX 30 index has returned an average of around 7.75% per annum. It contains some big hitters, from H&M to pharmaceuticals giant AstraZenica. Volvo, Ericsson, Electrolux, Nordea Bank and Skanska are other internationally known brands that figure. Over the same period, Norway’s Oslo Børs (OSEAX) has returned whopping annual average returns of around 11.7%. Telecoms company Telenor is well known in Europe and the other big companies are mainly in the oil and gas and fishing industries. 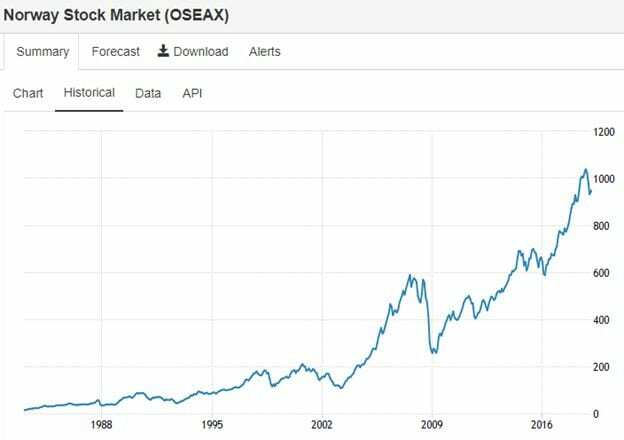 The Oslo index is particularly sensitive to the price of oil and tends to do well when oil prices are buoyant and struggle when they enter a bear market. 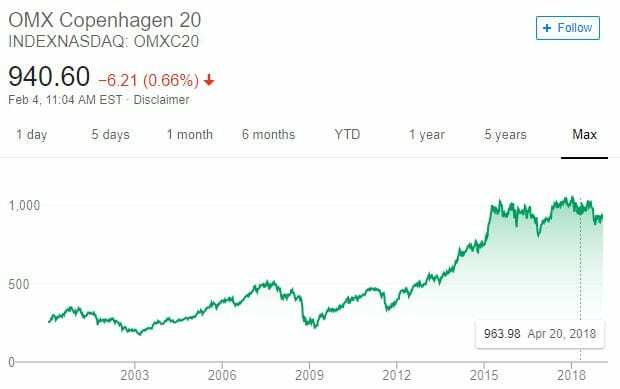 Denmark’s OMX Copenhagen 20 benchmark of the country’s 20 largest companies has gained almost 350% over the 17 years since 2002, translating into a compound average return of around 8.2%. Carlsberg and shipping company Maersk are two of the larger, globally recognised Danish companies among the constituents. 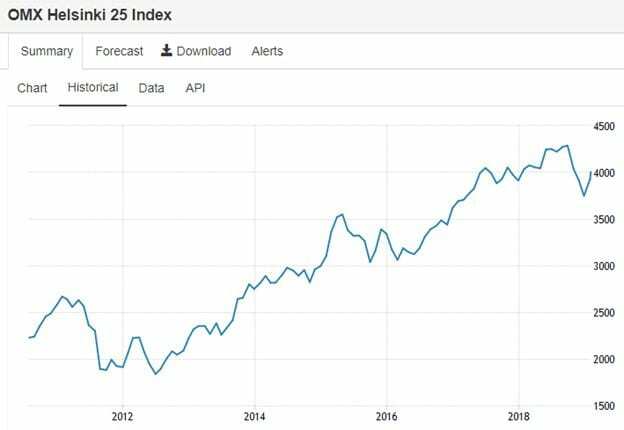 And, finally, over the 7 years since 2012, the OMX Helsinki 25 bench index has returned a compound annual average of over 11%. Keep in mind the lack of readily available data stretching further back for the Helsinki 25 means that these returns don’t include any periods of recession. Nokia is the best known international brand listed on the Helsinki stock exchange. 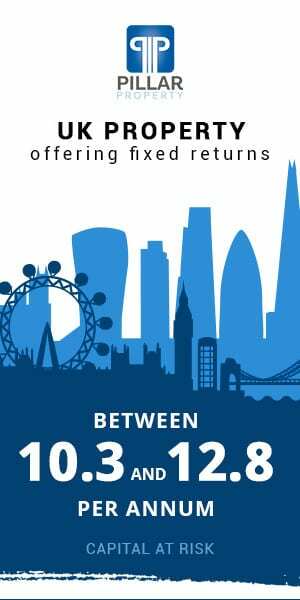 The average compounded annual returns generated by the FTSE 100 and S&P 500 indices over the last 27 years both considerably less, at around 4% and 4.5% before reinvesting dividends. While there is no guarantee that will continue into the future, investors would have made more money investing in the major Scandinavian indices compared to those in London and on Wall Street. Scandinavian fund managers also tend to outperform their counterparts elsewhere in Western Europe. 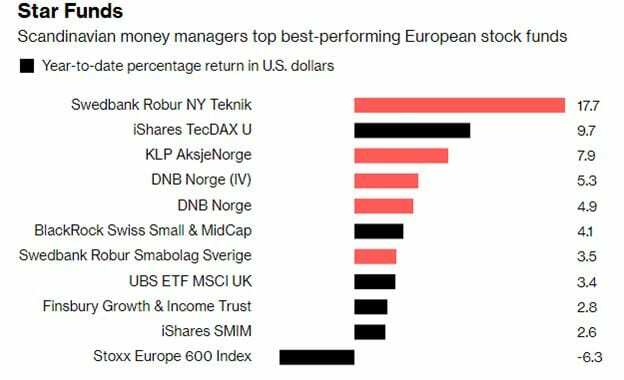 Last year, an August Bloomberg report showed that five of the 10 best performing West European equity funds with at least $1 billion in capital under management were from the Nordics – 2 from Sweden and 3 from Norway. As the rest of Europe was haemorrhaging capital, Scandinavian funds were attracting inflows. Their focus on smaller and mid-cap companies, stable economies and isolation from Eurozone risk proving to be a winning combination. 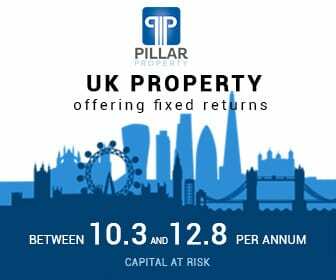 Investors from the UK interested in gaining exposure to the Scandinavian markets have several options. It’s certainly not a region for which there are a huge number of fund options but there are some. And part of the reason why Nordic investments can show such strong returns is that the companies listed on the region’s exchanges are less researched. This allows for more opportunity for good local fund managers or researchers to unearth less well-known and still undervalued gems. Fidelity has a Nordic fund and there are several ETF options to track the main Scandinavian indices, such as those covered above. More adventurous investors who want to stock pick themselves may find researching Nordic companies in English is a challenge. But that could even be part of the fun!